Thermal stabilization of nanograined metallic microstructures (or nanostructures) can be difficult due to the large driving force for growth that arises from the inherently significant boundary area. Kinetic approaches for stabilization of the nanostructure effective at low homologous temperatures often fail at higher homologous temperatures. Alternatively, thermodynamic approaches for thermal stabilization may offer higher temperature stability. In this research, modest alloying of aluminum with solute (1 pct by mole Sc, Yb, or Sr) was examined as a means to thermodynamically stabilize a bulk nanostructure at elevated temperatures. Following 1-hour annealing treatments at 673 K (400 °C) (0.72 Tm), 773 K (500 °C) (0.83 Tm), and 873 K (600 °C) (0.94 Tm), the alloys remain nanocrystalline (<100 nm) as measured by Warren–Averbach Fourier analysis of X-ray diffraction peaks and direct observation of TEM dark-field micrographs, with the efficacy of stabilization: Sr ≈ Yb > Sc. The disappearance of intermetallic phases in the Sr- and Yb-containing alloys in the X-ray diffraction spectra is observed to occur coincident with the stabilization after annealing, suggesting that precipitates dissolve and the boundaries are enriched with solute. E.A. Lass is employed by the National Institute of Standards and Technology. U.S. Government work is not protected by U.S. Copyright. Manuscript submitted June 30, 2014. 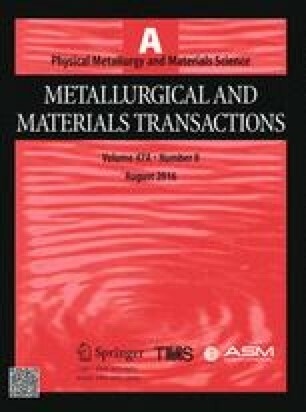 The authors would like to acknowledge Paul Fraley (Michigan Technological University Particulates Processing Laboratory) for his assistance in melt-spinning sample preparation, Ed Laitila (Michigan Technological University Applied Chemical and Morphological Analysis Laboratory) for his assistance in X-ray diffraction analysis, and Owen Mills (Applied Chemical and Morphological Analysis Laboratory) for his assistance in TEM sample preparation. The following copyright wording should be placed in the block with the author affiliations: E.A. Lass is employed by National Institute of Standards and Technology. U.S. Government work is not protected by U.S. Copyright.